If you have been trying to access this site for the past few days and have been getting a server error message, I do sincerely apologise. I was not aware that there was a problem with the server and that the site was down. It has since been fixed and I thank you for your patience.Â Do feel free to email me in future if you try to find your way here and find the site missing or broken. I do appreciate it. 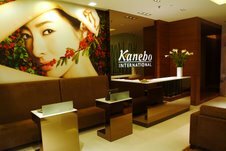 31 October 2007 approaches and with it, the expiry of the special 50% off first trial facial treatment offer at the Kanebo International beauty salons for readers of “My Women Stuff”. You can read about how to go about getting it here. 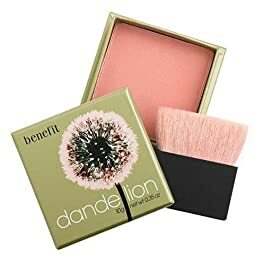 I’d heard a lot about Benefit Cosmetics’ Dandelion all over face powder for a while. However, reviews were mixed about it. Most people felt that it was too light and did not show up on their skin at all. Some of these complaints were even from girls with very light colouring, so I was rather reluctant to try it. After all, it costs RM129 here in Malaysia. However, I managed to snag one from the USA for US$28 and thought to give it a shot. I was actually pleasantly surprised at the result. Dandelion is supposed to be an all over face brightening powder as opposed to a blush. However, as the colour does come out rather pink I don’t think its really advisable to use it as an all over powder. In the pan, the blush is a light pink with slight purple tone. On skin, it is a very light pink but don’t bother trying it on the back of your hand – doesn’t show up. The colour is sheer but that is good because you are less prone to make mistakes. You can layer it on for more colour where you want it or just have a barely there hint of colour. I use about 2-3 layers and I’m very impressed at the illusion of an inner glow radiating from the cheeks. Its a very natural look and very sweet and pretty. Its no wonder that Geekchic loves this one so! I use this one on days when I’m rushed for time in the mornings and cannot afford a mistake. Or, I use it when I want a sweet innocent “no-makeup” look. It gives a cute pinky glow unlike Georgia which gives me outright radiance. Like Georgia, I can see this working for lighter skinned girls but less so if you are tanned or darker skinned. The powder blush comes in a rather large square pan in a sturdy cardboard box and a brush. As the blush is set rather deep in the box, I don’t really like the packaging. I prefer packagings where the blush sits higher as it makes it easier to swirl colour on the brush. Another thing that bugs me rather is the smell. There is a very sweet smell when you open the box. However, the smell doesn’t stay on the skin. Still, it can be uncomfortable for those who don’t like fragrance. Get it online at Benefit Cosmetics for US$28. My apologies for the silence and lack of updates on this site. I’ve been having a busy time and this site unfortunately had to take a little bit of a back seat while I sorted things out. But now that things have moved on, I will be posting more reviews soon.